AT THE HEART OF JERUSALEM is the Noble Sanctuary, Al-Haram al-Sharif, enclosing over 35 acres of fountains, gardens, buildings and domes. At its southernmost end is Al-Aqsa Mosque and at its centre the celebrated Dome of the Rock. 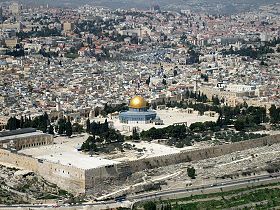 The entire area is regarded as a mosque and comprises nearly one sixth of the walled city of Jerusalem. The Noble Sanctuary is one of the three most important sites in Islam, and a showcase for Islamic architecture and design from Umayyad to Ottoman times that continues as an important religious and educational centre for Muslims to the present day. A production of SaudiAramco Saudi Aramco, the oil company born as an international enterprise 75 years ago, distributes Saudi Aramco World to increase cross-cultural understanding. The bimonthly magazine's goal is to broaden knowledge of the cultures, history and geography of the Arab and Muslim worlds and their connections with the West. Michael and Barry Gross have produced panoramic and media-rich documentation of world architecture for Williams College (where they are co-directors of the Virtual Architecture Project), University of Virginia, the "Rome Reborn" model of ancient Rome and the Samuel H. Kress Foundation. They recently authored and edited a guide to digital panoramic photography for ARTstor and the Society of Architectural Historians. Oleg Grabar is Professor Emeritus of Islamic Art and Architecture at the Institute for Advanced Study at Princeton, New Jersey. He is the author of The Dome of the Rock (2006, Harvard) and The Shape of the Holy: Early Islamic Jerusalem (1996, Princeton). Audio Guide production by Tom Verde and David Lugo. Recorded at Hagens Recording Studio, Princeton NJ.